Oh how I’ve missed you all! Making my “Glo Girl” Comeback all about YOU with quick and easy links included, just in time for the holidays! So how do I know all of this works? A combination of watching my skin age rapidly (at 31) to watching it miraculously “heal” (at 35) and learning as much as I could from the nutritional protocols I’ve been taking for years to restore my health back to optimal, after fighting a three year battle with an autoimmune disorder, chronic inflammation, adrenal fatigue and hypothyroidism. All of this, without drugs, and using only organic, food based supplements and food as medicine. Did I trust this process always? NO. Was I willing to try it? YES. Why? Because I didn’t want to be drugged for the rest of my life. I didn’t want to suffer anymore. I tried all medical routes and they failed me. I wanted to prove “the experts” wrong. I’m stubborn. I don’t give up easily. And thank God for that, because this way of life not only didn’t fail me, it changed me. The point of bringing up my health history for this particular blog, is that, quite simply, “We Are What We Eat.” Part of what makes my skin look better than ever, is my every day diet. Predominately plant based, high in good fats and omega’s and low in sugar, with nothing processed EVER. So, with that said, if your diet is total crap, this regimen will not work well. If it’s used in combination with a clean diet, then get ready for a straight miracle. For the first time ever, I can say I’m totally in love with the way my skin looks and feels. Considering thirty-six is just around the corner, when we, as women, are supposed to see the biggest decline in the condition of our skin….. I’m stoked to say, I’m not losing this battle, and hopefully changing the way women look at anti-aging and skin care. Botox and Fillers are not the future of anti-aging and they shouldn’t be the norm. Like drugs, they are a quick fix and loaded with toxic chemicals. Plant based beauty solutions have been around much, much longer and European women, being much more open to this way of anti-aging, are proof that it works. With that said, these products are absolutely, hands down my go-to’s every single day, and I’m so excited to finally share them with you. Happy Holidays Y’all! Best Moisturizer: Tied between Elska Apotheke Rosehip and Frankincense Ultra Hydrating Cream (made locally here in Los Angeles) https://www.etsy.com/shop/ElskaApotheke and Super Goji Peptide Perfecting Cream by Andalou Organics. http://www.vitacost.com/andalou-naturals-super-goji-peptide-perfecting-cream. Both of these are anti-aging power houses. I switch these up morning and night. Best Makeup Remover and Serum in One: Hands down, Organic Coconut Oil in a jar!! Dr. Bronners is the best. Removes even the toughest waterproof mascara. Swipe cotton pad over hardened oil. Found, anywhere. Best Eye Cream: Kat Rudu Cucumber Cooling Eye Bright Gel. Beverly Hills Beauty Icon famous for her “Jet Set Facial” and responsible for making Kate Beckinsale’s face the most beautiful face over 40 I’ve ever seen. Also, I’m lucky enough to be one of her clients. I adore this woman’s use of organic ingredients. Best Shampoo and Conditioner: For growth and lifeless, fine hair. Andalou Organics Biotin infused S&C is the longest running Shampoo and Conditioner I’ve ever used. Best Deodorant: I hope, by now, I don’t have to reiterate the importance of using Aluminum Free Deodorant. You’re trapping years worth of toxins that need to come out. Want an all natural deodorant that truly works so you can sweat them out once and for all, while not allowing cancer causing Aluminum to seep in to your breast tissue?! Boom! So good you can skip a day. http://www.trulysnaturaldeodorant.com/ (Store in warm place so that it’s easier to apply). 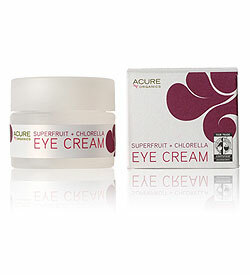 Chlorella, Goji Berry, Rosehips, Yerba Mate, Acai and Coconut Oil all in one eye cream? Yes please. Little jar of hope and wonder. Watch in awe as your little old lady lines disappear. $18.99 at Whole Foods or http://www.acureorganics.com .